The Olbia (OLB) airport is 35 km from Hotel Le Ginestre and it is served daily by connections with the rest of Italy and other European cities. On May 11th and 18th dedicated airport shuttles will be arranged to transport guests between the Olbia airport and hotel Le Ginestre. Olbia airport is served by many low cost and traditional airlines. Please consult the search engine Skyscanner for a complete list of up to date travel options. Booking early will ensure the lowest fare. Should you not be able to benefit from the direct flights, we recommend that you fly to Rome (FCO) or Milan (LIN or MXP) and connect to one of the regularly scheduled flights to Olbia (OLB) with Air Italy or EasyJet (Malpensa). There are 3 flights from Rome, 3 flights from Milan Linate, and 3 flights from Milan Malpensa MXP daily. It is possible but not easy to arrive to Porto Cervo (Olbia) from Alghero (130 km) or Cagliari (265 km) airports. From Alghero probably renting a car and driving to the Olbia airport is the most sensible solution for small groups. Otherwise you may consider taking a train or a bus from Alghero airport via Sassari. Please do not contact the hotel directly for reservations, ENII manages the group reservation for the School. 2. By taxi: € 60,00 each way (+20% night rate); duration 30 minutes. 3. 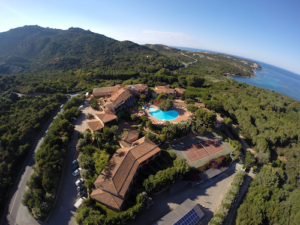 You can reach the town of Porto Cervo by public bus line 514 (from Olbia airport to town of Olbia) and line 604 (from Olbia to Porto Cervo – once per day only). 4. Walking distance between Porto Cervo and hotel Le Ginestre is about 20 minutes. Taxis are readily available outside of the Arrivals hall of the Airport.